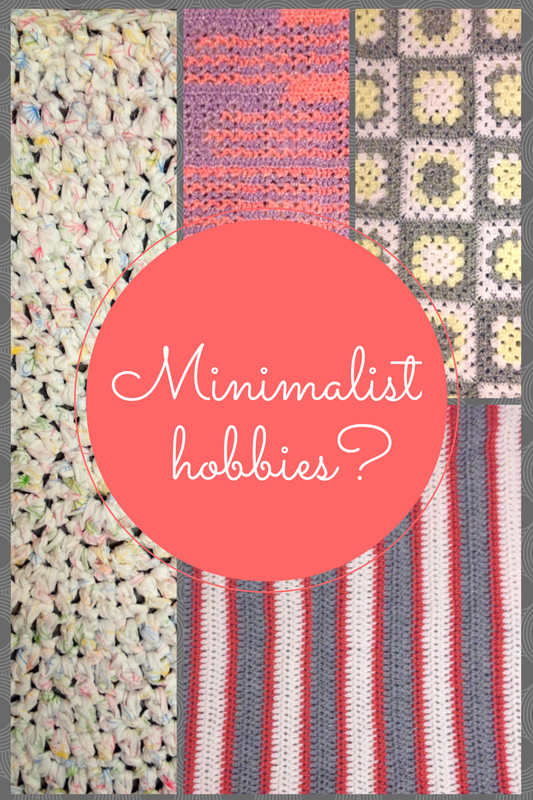 Can a Minimalist Have Hobbies? The answer, before I give you my reasons and ramblings, is yes. A minimalist can darn well do what a minimalist wants to do as long as it fits in with the lifestyle they’ve been designing. As always, to each his own – there’s not just one type of minimalism. When I made the decision to work from home, I also made the decision to allow way more time into my life for – gasp – things that I actually love to do. It seemed like a foreign concept at the time, but now my projects have taken off faster than I can keep up. Crocheting is my weapon of choice – yours may be woodworking or coding or writing or cooking. Or llama raising, that too. I did realize that my massive amounts of yarn and growing pile of completed projects has started to take up a significant amount of space. I’ve downsized my craft supplies multiple times, but I still seem to find balls of yarn randomly tucked into places I wouldn’t expect. So how does that work? What if my hobby requires that I have stuff to make stuff? And what do I do with that stuff when it’s done? What that also means is that I need to start getting rid of some of my many crochet projects. I’ll be populating my Etsy store soon with some of my most magical creations and selling/giving/donating to family and friends throughout the holiday season. Ultimately, you need to ask yourself if your hobby can reasonably fit your lifestyle. If not, what are you willing to change about one or both of them to make sure you can stay balanced? Is this truly something that adds richness and value to your life? If it’s a once-a-year rediscovery, it might be time to put it to rest. If you want to get better, make the commitment to truly learning it and honing your craft! How can you simplify this hobby to include less gadgets, materials or other accessories that go unused for large portions of time? What should your focus be on at this very moment? Get rid of or finish additional projects so you can maintain focus (yes, I did say “get rid of” – I’ve been discarding years-in-the-making projects that I knew wouldn’t ever be completed, and it’s actually a huge relief). So three things: consider, simplify, focus. I used to think I wanted to sew, knit, crochet, write, spin yarn, design clothing and make my own cheese. But I’ve cut it down to something more manageable – crocheting and writing. I can still dabble in the other things, but I decided to refocus on the two that I really wanted and that I felt brought that richness to my life. However, if you want to focus on three or four hobbies, don’t try to do them all at once. A tip I learned from The Accidental Creative (awesome site and great book, by the way) is to schedule out what you want to focus on, much like semesters in an academic calendar. Every three months, you switch to a new focus (this can be for learning new things or can be adapted to suit your hobbies). I know Tammy Strobel‘s love of photography suits her tiny house living perfectly, and many other minimalists focus in on writing as their main hobby/career path. What is your go-to hobby, and how have you integrated it into your lifestyle? This entry was posted in Minimalism and tagged crafts, crochet, hobbies, minimalism. Bookmark the permalink. At the moment it’s mostly sewing and reading. Reason: I have lots of left-over fabrics I want to use up (and if it’s not enough to make clothes, I make gift bags, because I think it’s nonsense to buy wrapping paper, something you only buy to throw away…), and I have lots of unread books in my bookcase that I do want to read (but not keep, so after reading they can leave the house).